Are geothermal heat pumps reliable technology? Are there many companies that make this green technology equipment? How can I compare information about equipment models for these systems? With the growing popularity of geothermal air conditioning and heating systems in Texas and around the world, more and more manufacturers have designed equipment that uses ground source heat pump technology. From trusted, long-established companies that are household names to newer companies that specialize in manufacturing these products, you have a broad range of choices. You’ll find models to match any type of installation, and in capacities to match any home’s size. All offer advanced engineering and designs that ensure reliability and performance at affordable, competitive pricing. Here, you’ll find detailed information on brands and models that are popular in Houston, Dallas Fort Worth and San Antonio. In our directory of licensed, experienced HVAC contractors, we list many companies that supply, install and maintain one or more these product brands and models. With over 50 years of experience in design and manufacturing of geothermal heating and cooling systems, Oklahoma City-based ClimateMaster has a long history of serving Texas homeowners. Today, it offers an extensive line-up of forced-air packaged systems, split system units and water-to-water heat pump systems designed to save homeowners money by using the stored energy underground on their own property. Supplied, installed and maintained by many Texas AC contractors, ClimateMaster systems should be on your list to consider. Every Texas homeowner is familiar with the Carrier brand name when it comes to home comfort systems. Carrier’s reputation for quality, reliability and performance is second to none. If you’re considering a geothermal heat pump to handle your heating and air conditioning needs, you probably know how much you can save on energy bills over time by getting free energy from underground. Carrier offers a full range of high-efficiency systems that use this advanced green technology, at competitive pricing that makes Carrier equipment a popular choice for many homeowners and residential developers. As one of the most highly respected residential air conditioning and heating company in the USA, Trane offers a complete line-up of geothermal HVAC equipment to meet the needs of any Texas home. Highly-rated and offering 10-year limited factory warranties, they’re a frequent choice of discerning property owners and developers who want the ultimate in efficiency and money-saving power. Outstanding in durability and compatible with all residential designs, there’s a model that is ideal for homes of any size and keeps your costs within your budget. While geothermal air conditioning and heating products are available from companies that make a wide range of residential HVAC equipment, GeoComfort, A division of Enertech, focuses on this developing technology exclusively. GeoComfort products are manufactured in Mitchell, South Dakota. The company offers a complete range of systems that are designed to take maximum advantage of thermal energy stored in the earth itself. Available from independent HVAC companies everywhere in Texas, there’s a system that’s ideal for any home. WaterFurnace is a leader in geothermal technology, and is headquartered in Ft. Wayne, Indiana. Renowned for their advanced engineering and reliable, money-saving ground source heating and AC systems, their full line of products is growing in popularity. Available from many Texas AC companies, their extensive model line features industry-leading warranties for models designed to suit any home size and design. 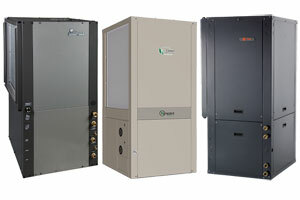 From all-in-one packaged forced air systems and split system models to a wide range of hydronic systems, consider WaterFurnace when making your decision. Tens of thousands homeowners have adopted this green technology to keep their homes comfort across Texas, from Martindale, Pleasanton and Leon Valley to Alamo Heights, Waring and Brazos in the San Antonio area, from Keller, Roanoke and Seagoville to Frisco, Rowlett and Cedar Hill in the Dallas Fort Worth area, and from Dobbin, Lochridge and Kendleton to Montgomery, Kemah and Monaville in the Houston area. As with any investment in your home, homeowners should carefully compare the products they choose. It is important to compare manufacturers, model lines, warranties, prices, installation cost and more. You can search online to find product reviews and consumer experiences with these products. Most importantly, though, get detailed information from Texas AC companies near you for a consultation, so you can get professional evaluations of your requirements, detailed price quotes and information on how much you can save with this green technology. You can rely on these companies’ experience and recommendations, as well. The more information you have, the better able you’ll be to make an ideal, money-saving choice that gives you outstanding home comfort that fits into your budget.